When we think of the music of West Africa, it’s often the sound of the kora that comes to mind. But that sophisticated harp-like arrangement of calabash, skin and strings is a relatively recent invention. Going back to Mali’s golden age of Sunjata Keita and the Mali Empire in the 13th century the kora is an instrument of the future. The instruments of Sunjata’s time were drums, the ngoni lute and the balafon - the west African xylophone. The balafon, or similar ‘fixed key’ xylophones are found in all the Mande areas of West Africa (Mali, Guinea, Gambia, Burkina Faso), where it is thought to have originated. But similar instruments - with different names and tunings are found across West Africa. Sonically, it makes a delicate backbone to the music and adds a percussive bounce. The Senegalese national anthem, with words by poet and president Léopold Senghorsays pluck your koras, hit the balafons. “When I started aged four, I didn't want to learn, I wanted to play football,” says Mamadou Diabaté. “But my father said come to the school and my school was the balafon. By the time I was eight I could play very good and I realised it was a great thing to do.” Certainly in balafon families boys are simply expected to follow the tradition. Mamadou Diabaté was born in one of the heartlands of balafon playing in Burkina Faso. He now lives in Vienna from where it’s easier to tour, and he’s one of the most popular balafon performers at festivals round the world. His seven-strong group Percussion Mania includes 2 balafons, the second played by his brother Seydou Diabaté. In the Sunjata Epic, the national myth which tells of the creation of the Mali Empire by Sunjata Keita (approx 1217 – 1255), the balafon plays a key role. Sunjata’s rival Soumaoro owned and played the original balafon, an instrument shown to him by spirits. It was called the Sosso Bala, the balafon of the Sosso kingdom and he forbade anyone else to play it. In one of his battles, Soumaoro captures Sunjata’s griot who defies Soumaoro and plays the balafon. But Soumaoro is so astonished by what he hears that he names him Bala Fasséké (the balafon player) and makes him the guardian of the Sosso Bala. In some versions of the story Sunjata finally kills Soumaoro and liberates Bala Fasséké and the balafon. In other versions, Bala Fasséké steals the balafon and returns with it to Sunjata. Either way, Sunjata ends up with the balafon prize. So no surprise that the music conservatoire in Bamako is named after Bala Fasséké Kouyaté, the supreme griot. More surprising is that the Sosso Bala still exists and is still kept by a guardian from the Kouyaté family in Niagassola in the north of Guinea. The guardian, called the balatigui, is the only person allowed to play it and only on special occasions. When making her film about the Kouyaté griot family Dò farala a kan: Something has been Added(http://growingintomusic.co.uk/mali-and-guinea-music-of/films-of-growing-into-music.html) Lucy Durán visited Niagassola and saw the balafon which is kept under lock and key in a mud hut. She wasn’t allowed to film it, although she did film a replica. But can the balafon really be over 800 years old? “As one key key gets broken, it has been replaced by another exactly the same and the frame hasn’t been altered,” she says. “Even if nothing actually remains from the 13th century, there’s no reason to believe the balafon has changed in size or sound.” It’s bigger than most contemporary balafons with a heavy buzzing sound. A balafon usually has around 21 keys, often of rosewood, which are attached to a frame with leather or string. 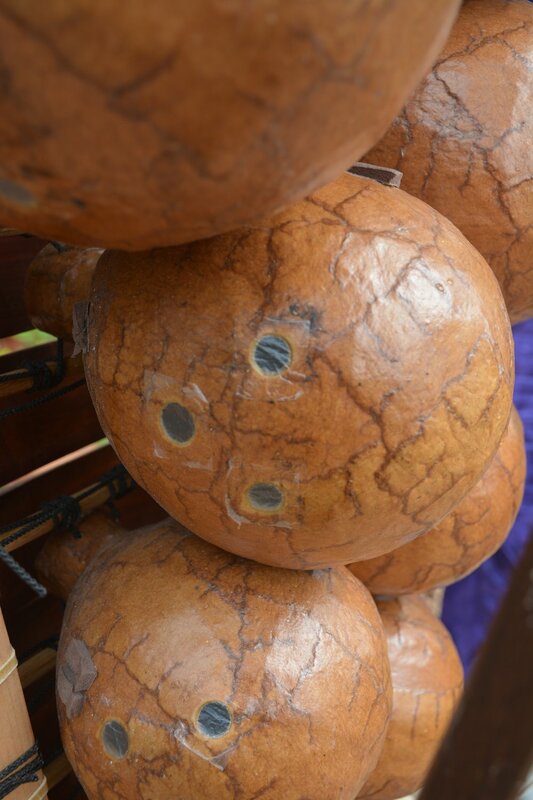 Beneath the keys are resonators made from calabash gourds. The gourds each have a hole with a membrane traditionally made of spiders’ egg-sacs, although now usually very thin plastic. These are amplifiers which also create the buzzing sound. The keys are tuned by shaving wood off the underside to lower the pitch and shaving it off at the ends to sharpen them. Across the region, tunings and scales vary. But broadly-speaking there are pentatonic (five-note) balafons, which are usually curved (this is what Mamadou Diabaté plays) and heptatonic (seven-note) balafons which are flat (as played by Lassana Diabaté, one of Mali’s leading players. The traditional tuning is with seven equally-spaced notes, but nowadays they are often tuned to a Western diatonic scale. The Mande repertoire on the seven-note instruments tends to use longer, more lyrical melodies. While the music of the pentatonic balafons, of the Senufo and smaller ethnic groups like the Sambla, Siamou, Tusia and Lobi in Burkina Faso sounds more percussive, with short rhythmic motifs and patterns. In all the traditional music, the balafon is often accompanied by other percussion or the bolon, a simple calabash harp. The balafon is frequently used at funeral ceremonies. In this small region of Western Burkina Faso there are three ethnic groups, the Samba, Tusia and Siamou, each with their own pentatonic tuning. In the Sambla tradition they use a small portable balafon with 19 keys, which is played solo for people working in the fields. And a large balafon with 23 keys for weddings and funerals which is played by three people. According to Mamadou, the pentatonic notes of the balafon relate to the five vowels of the Sambla language, which is tonal. Whole volumes have been written on the subject, but he says it’s possible to speak with the balafon: “Without opening the mouth, we can tell our stories, report on current events, chat with the people around, mock people who annoy us, and even flirt,” The senior player plays the melody in the upper register, “which speaks to the audience”, he says. The second player, to his left, plays in the low register and adds to the solo, while the third plays a sort or repeated obstinate or accompaniment on the other side of the balafon. The sound is a complex interlocking texture. Mamadou has recorded this repertoire playing all three parts. Mamadou Diabaté didn’t want to play balafon in the fields, so aged 11 he left the village and went to Bobo-Dioulasso, sleeping in the streets andlooking for work as a musician. He won a prize in a competition aged 12 and in 1988 was fortunate enough to be invited into one of the National Groups for Traditional Music. They’d play for visiting dignitaries, tourists and tour to Europe. 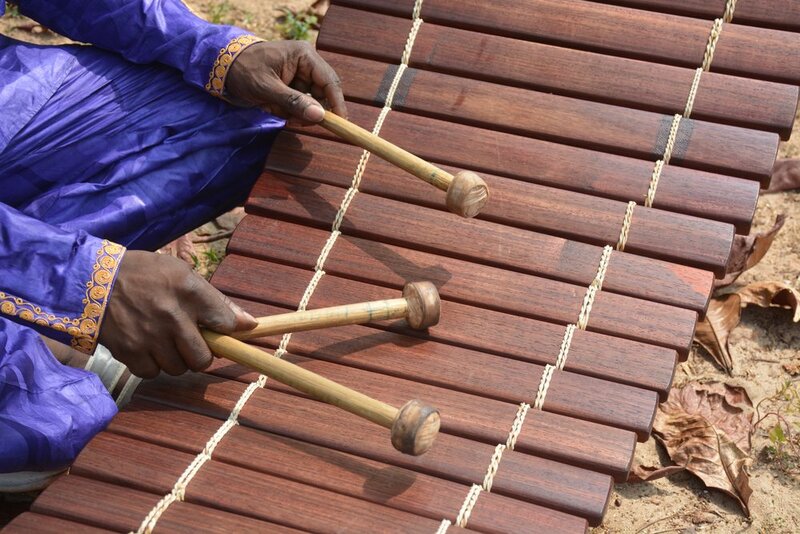 Like many marimba and vibraphone players, Mamadou often uses two sticks in each hand, but the traditional players in West Africa just use two. In Mali, the big name of balafon playing, until his death in 2012, was Kélétigui Diabaté. He was asked to start the first National Orchestra in Guinea, under president Seckou Touré and was a founder-member of the Malian Orchestra National. He accompanied many of Mali’s leading singers, including Ami Koita, Kandia Kouyaté, Salif Keita and Habib Koité. But he was also to be found regularly performing in Bamako nightspots. He started playing two seven-note instruments, one a semitone higher than the other, so he could play a complete chromatic scale. Now Mali’s leading master, playing in the same style, is Lassana Diabaté, a member of the new Trio Da Kali, with a forthcoming album (with Kronos Quartet) on World Circuit. Coming from the heart of the tradition, the trio are great performers of the Sunjata Epic alongside more contemporary repertoire. The leading player in the pentatonic tradition of the Senufo people is Neba Solo from Sikasso, Mali. And it’s here where the biggest balafon competition is held, the Triangle du Balafon. Mamadou Diabaté and Percussion Mania were winners in 2012. Mamadou in his current 7-piece performing groups plus vocalist Kandy Guira. Contemporary, but rooted in the tradition, with guests Toumani Diabaté and Cheik Tidiane Seck. In a first for Sambla music, Mamadou multitracks traditional Sambla music playing all three balafon parts himself, plus two dundun (bass talking drum). Traditional music for three balafon players from the Sambla, Tusia and Jula traditions rearranged for solo balafon. Mali’s most famous balafon master(1931-2012), who worked with Ami Koita, Salif Keita and Habib Koité. This is his superb solo album including Toumani Diabaté, Djelimady Tounkara and Habib Koite, amongst others, as guests. A TOTW in #30. In Guinea. El Hadj Deli Sory Kouyaté (1918-2009) traced his ancestors right back to Bala Fasséké Kouyaté. Traditional repertoire for the seven-note balafon and strongly highlighting it in the mix. There are three volumes in this Anthology of the Manding Balafon. (Ocora, 1999) Funeral music of the Lobi people in southwest Burkina Faso. Two balafons with bèmbè drums plus strange vocal lamentations. This is serious listening. London-based ensemble lewd by Bex Burch, around the gyil balafon of the Dagara people in northwest Ghana (and Burkina Faso). Energetic, funky and contemporary. An excellent set of field recordings of the balafon playing of six of Burkina Faso’s ethnic group - the Siamou, Birifor, Gan, Dagara, Dian, and Lobi. Vivid and excellently recorded. Much less known but similar to the balafon, the timbila is played by the Chopi people of Mozambique. The great master was the late Venancio Mbanda. This recording is the best introduction to this vibrant music with large xylophone ensembles..